This is an extract from a tWRF 68-page publication titled: The Pride Of Our Waterfront Heritage – The Renaissance of Urban St George, which is due for circulation in May 2019. Because of the current public concern and anxiety which has gone viral due to the extent of the deterioration and the impending danger to public safety, it was decided to release this section in advance, for public feedback and to obtain a response from the authorities. 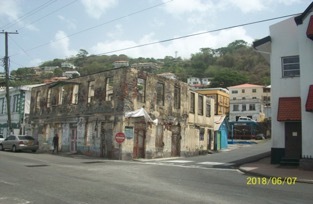 The Willie Redhead foundation (tWRF) has always expressed its concerns about the derelict buildings in St George’s and its environs. The owners or inheritors of these buildings obviously have lost interest in their maintenance and refurbishment, perhaps due to escalating construction and maintenance costs, and in some cases absentee owners who do not intend to return to Grenada. The buildings have become a source of infestation from mosquitoes, rats, roaches and other disease-carrying rodents and insects and also poses a threat to public safety and the incidents of fire. The commencement of refurbishment/reconstruction must commence within a year and completed within a specific period. The design must conform to the architecture specific to St George’s, i.e. clay tiled roof and external brick facing in the Georgian Style. Government to grant duty-free concessions on materials. The developer/investor must be local or have local interests. A waiver of outstanding property taxes owed on the derelicts. Restored property is not to be sold before 20 years. No entrepreneur would be allowed to acquire more than 2 properties. We believe bank loans can be based on the value of the land as collateral, and not clean up costs. This would certainly encourage local investors and perhaps give the present owners, if any can be identified or determined, a new start. It not only detracts from the beauty of Granada, but it is a huge safety concern with the infestation of pests, and the building falling down. If this were in Australia, squatters and drug addicts would be living there. Pull those eyesores down. Hi Mr. Redhead, thanks for taking the time out to bring attention to this issue, as a Grenadian living abroad but frequently visits the homeland, this issues of abandonment of infrastructure gives me great concern whenever I return to visit. I often ask my self what is the focus of our government , its been many years of seeing the same condition of the city limits, and instead of beautifying the central point of the capital ,it seems to be falling apart. There are a few major issues that are of my concern and should be pivotal to all parties involved in running the country , the abandonment of unused or discarded automobile around the country is a huge issue, the deposit of unused household appliances is another major issue . Just a few months ago we had an out break created mostly from mosquito infestation and yet there have been very little being done to combat this dangerous plague. I often wonder if the people in charge or the government in particular ever takes a drive around the country , although you really don’t need to drive around the country to notice these issues are becoming a major problem . Theses old appliances carry a component which is Freon and is known to cause major issues to our ozone layer, and yet our government has paid it no attention but continues to speak about green initiative project , we need a recycling system and laws that will make illegal to dispose of such items , heavy fines should also be implemented and rewards should be offered to report anyone that violates such ordinance , we are a small island but it does not mean that some of our bad habits is not contributing to some of this worlds disaster like global warming. I am aware that the government has made an effort to ban Styrofoam which is a good step in the right direction but releasing Freon into the atmosphere is much more dangerous ,if we don’t tackle this issues we will not have fishes to worry about them eating Styrofoam.